There are 5 dedicated studios for our Loc and Dubbing services. Dub room 1 is designed for Theatrical dubbing. 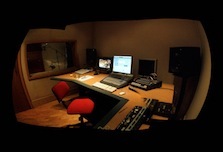 Dub rooms 2, and 4 are specifically designed for television dubbing and radio advertising projects. Studio 3 is designed for mixing…. Studio 5 is designed for audio post, editing, copies, transfers, etc. All 9 rooms are configured as digital recording and editing suites with Pro Tools 7.4 / 8 on Mac computers. Studios are internally connected via our Gigabit network. also SmartJog , and uses digidelivery and FTP servers for secure and fast delivery. video format, Digi beta, beta sps, XDcam , DVC pro etch.